Customs and traditions are such a large part of our culture and who we are. When I first moved to Colombia, it was many of these small nuances that I found difficult to navigate, such as asking everyone how they are at least five different times when you first meet. I even had to get used to kissing my colleagues on the cheek every morning (or risk being considered rude if I do not) and doing the same when first meeting someone new. Now I find it awkward to shake hands when meeting someone new because it seems so formal. So while these customs are often strange to change at first, they can easily become second nature. This is a photo I took of traditional Cumbia dancers at Carnaval de Barranquilla. This carnival celebration is the biggest in the world after Rio de Janeiro´s. The special hat worn by the men in this photo is a sombrero vueltiado and it is one of the most recognized symbols of Colombia. The same is with how the Internet has changed the way we read and write texts. This is an area which I explored in depth through ETEC 540: Text Technologies – The Changing Spaces of Reading and Writing. We were asked to respond to an article of our choice that we had read as part of the coursework. I chose to respond to Neil Postman´s first chapter from his book Technopoly. His argument was that technology is changing the customs of society, and while in many ways I agree, I also feel that the role of teachers is not being replaced by technology, but we are in fact becoming more and more important. Please read the rest of my response at its original post. In this course, were asked to explore new technologies that would help us solve a problem in our classrooms. I explored a site called Dumper which makes it extremely easy to play with photos and create quick projects. 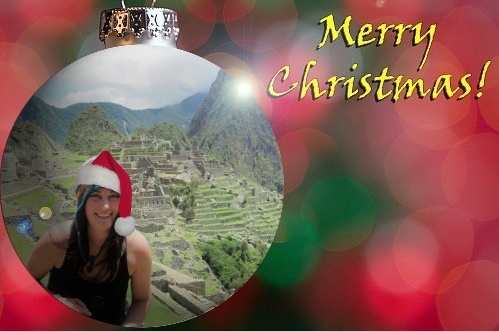 I had fun creating my own Christmas card using a photo of me at Machu Picchu. Please read my full reflection on the course blog. As with any culture, in the world of education there are particular customs, or standards, that we expect in terms of research. ETEC 500: Research Methodology in Education explored the methods that are generally accepted in the educational research world. As this is a core course in the MET program, it is expected that students take this course at the start of the program in order to familiarize themselves with the customs (and even some of the language) that are related to the new culture we are learning about. Learning these customs really helps MET students to immerse themselves in the new culture, which they hope to fully adapt to after the MET program. Cultures involve a set of norms that are built around customs and traditions, beliefs and values, language, food, and the arts. Research methods are a norm in the research world.